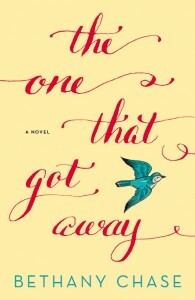 I had the pleasure of coming across Bethany Chase’s debut women’s fiction, The One that Got Away, a couple of months ago when I was looking for a de-stresser. I saw her book on the shelf with an Emily Giffin blurb, and I was sold. Easy-to-read and well-written with a captivating first line that will draw you in, once I finished it, I was left wanting to know more about the talented woman behind the pen…so I decided to interview her! Read on to find out how this bestselling author developed her craft, found an agent, and connected with Emily Giffin—as well as how her writing has changed between her first and newly released second book. One of my favourite things about your first book is that it used very unique descriptions and similes. (I still remember that you wrote that Noah’s eyes were like “oxidized copper”—loved that!) How did you develop your writing style? Thank you for the compliment! I think my style is a combination of my personal voice—when people close to me in real life read my books, they say it’s like hearing my voice in their head—and a lot of work and practice. I particularly love description and metaphor, so that is an area where I always work hard to push for a fresh idea or an unexpected turn of phrase. What advice do you have for others who want to write and publish a novel? Develop a thick skin, and never give up. From a technical point of view, I’d say to work hard to hone your craft, but also develop a filter for writing craft advice. This is something that just takes time and experience to learn to do, but there is a balance that has to be struck. If all writers followed all writing craft advice, we’d all sound exactly the same. There are basic rules of grammar and structure that must be obeyed for the sake of clarity, and there are a lot of well-worn guidelines that are well-worn for good reason (“Kill your darlings,” etc). But some of the advice you’ll see is purely about style, and that can and should be accepted or rejected individually. You mentioned on your website that you’re represented by Meredith Kaffel of DeFiore & Co. How did you find your agent, and what advice do you have for other writers who are looking for agents? I’m a perfect example in proof of the fact that you don’t need connections to get an agent. I actually had a connection when I was querying—a close friend of mine was a Big Five editor for a long time, and she knew several agents I was interested in—but while dropping my friend’s name in my query letter got my work requested quickly, it did not get me an agent. I wrote to Meredith cold, because I saw her interests listed women’s fiction and also non-fiction related to art and design. I told her I had a women’s fic novel set in the design/architecture industry, and indeed she was interested! I can’t underscore enough how essential the right fit of personality and work style is, when taking on an agent. It is in many, many ways comparable to finding the right romantic partner. From day one, Meredith has understood and supported not just the book I queried her with, but who I am as a writer, what position I want to find in the marketplace, and how I want to grow my career. I’m incredibly grateful every day to have her on my team, and I can’t imagine doing this without her. I enjoyed the character development and pacing of The One that Got Away (for example, how what’s really going on with Sarina’s wonderful stepfather John is hinted at throughout, but not revealed until close to the end). Once you had your story idea, how did you get your manuscript ready? Do you have any “methods” that you use, such as creating character analyses or plot diagrams? The One That Got Away was odd in that, when I started it, I had no specific intention of writing a book. I was just writing a scene sketch that amused me. 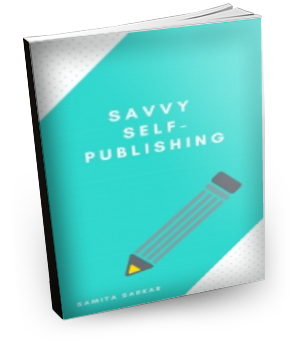 And then I kept adding to it and adding to it, and when I eventually realized that what I’d written amounted to about a quarter of a full-length novel, I decided to finish it and see what happened! Now that I’m farther along as a writer, I am much more methodical—I outline the whole story (although obviously it can change along the way), and I do in-depth character sketches beforehand as well. I also always write a few sentences along the lines of the “meat” part of a query letter, or the back jacket copy—I find it’s a very helpful exercise to force myself to identify the most interesting aspects of the story in a micro format. What was the most challenging part of writing your first book, The One that Got Away? Editing! And that’s been true for every book since. Which author most inspires your writing? I am drawn to writers with extremely strong voices. Joshilyn Jackson is basically my idol, and another discovery over the last year or so has been Deb Caletti. Deb is one of the most gifted writers I’ve ever read. I’ve also been evangelizing for Melissa DeCarlo since reading her debut, The Art of Crash Landing, earlier this year. She is incredible. On the cover of The One that Got Away, bestselling women’s fiction author Emily Giffin wrote you a great testimonial! How did you connect with her? Emily has been incredibly generous with her time and support of my work. She’s been one of my favorite writers since The One That Got Away was just a glimmer in my eye—in fact reading Emily’s debut, Something Borrowed, on my way to Virginia to say goodbye to my beloved grandmother helped inspire me to write TOTGA—and so I wrote her to tell her how much she’d influenced and inspired me. Your second book, Results May Vary, was just released. How has your writing changed between your first and second book? I like to think I’ve gotten better! As I mentioned, I’ve definitely become more deliberate in my plotting and decisions with my subsequent books, and I’ve continued working hard to elevate my language, as well. I will always keep learning and growing and practicing. Thanks for your time, Bethany! I can’t wait to read your next book. 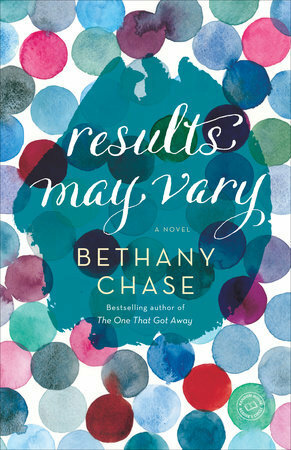 Click here to check out Bethany’s latest novel, Results May Vary, which was released today!